We’re on the eve of the Major League Baseball playoffs and both the Reds and Indians have qualified for the playoffs for only the second time in over 110 years. 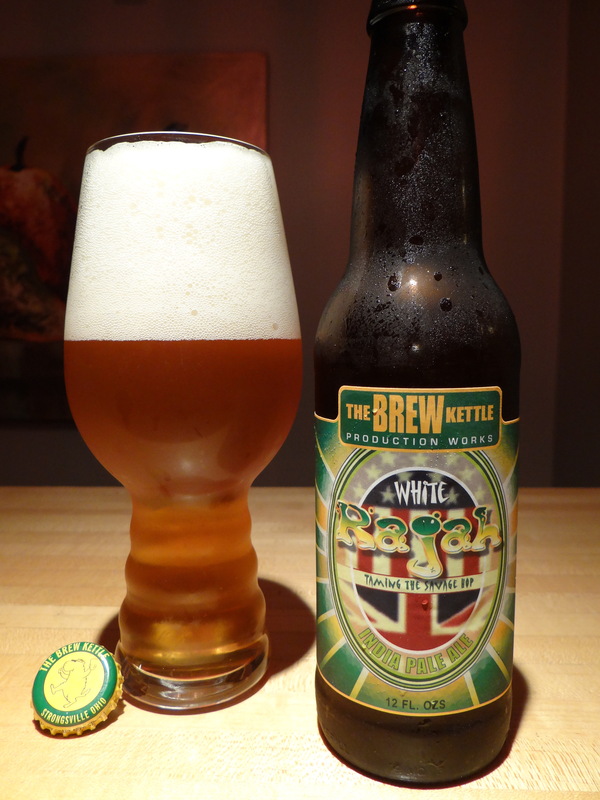 In celebration of that event (and the party may be short lived) I’m reviewing a popular Ohio beer tonight, White Rajah IPA by The Brew Kettle located in NE Ohio (Strongsville). This review also keeps with the theme of IPA week and I thought it would be good to review this beer close to Saturday’s review of another top tier IPA, Flower Power IPA, for comparison. On the pour White Rajah is a hazy, translucent beer that has a color I like to call liquid gold. It pours with a big, dense white head (see above) that leaves behind a persistent white lacing on the walls of the glass. The aroma is to die for, mangos, oranges, grapefruits, pineapple, about as fruity as an IPA can get. Finally coming to the taste, the fruit flavors are still front and center, but they give way to a slightly piney, lingering bitterness on the finish. This beer is a showcase for the hops, with no pretense of balancing them with the malts. The mouthfeel is kind of sticky as you tend to get with IPAs, although interestingly as it warms the mouthfeel actually gets quite creamy. I read one review of this beer that called it Imperial IPA taste with regular IPA alcohol content (6.8%) and I think that is a fair assessment. If you like beers dominated by juicy, fruity hops this beer is a must try. For the assertive hop-forward IPA style I think it is arguably the best beer out there. If you like your beers well balanced and subtle this is probably not your cup of tea. Note from experience I can tell you this is a beer and a style that is important to drink as fresh as possible. If it sits around for 3-4 weeks in the fridge the hops start to lose some of their potency and the taste becomes a little too sweet. Aging in the store is usually not a problem because this stuff flies off the shelves in Columbus. PS – Don’t miss the video review of White Rajah posted in the Taste Tests section as part of the IPA Blind Taste Test Challenge.